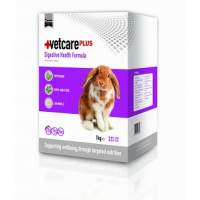 Vetcare Plus Digestive Health Formula is a daily Monoforage diet for rabbits. This digestive health formula provides a nutritionally balanced and complete daily Monoforage diet for rabbits and all breeds and life stages from 20 weeks+. VetcarePlus Digestive Health Formula is suitable for long term feeding to rabbits that are susceptible to digestive upset or rabbits who are prone to regular inappetence and reluctance to feed. This special food has been formulated with carefully selected blends of herbs and seeds ? peppermint, chamomile, fennel and linseed. The fibrous nature and physical properties of this Monoforage diet encourage regular water intake and uniquely extends feeding time, resulting in added dental wear and improved environmental enrichment.